American Chemistry Council (Washington, DC) assesses the New Plastics Economy initiative and finds there’s an emphasis on recycling at the expense of packaging functionality and other aspects of sustainability. America’s plastics makers welcome efforts to promote innovation and advance the sustainability of plastics, such as the Ellen MacArthur Foundation’s recent report, The New Plastics Economy—Catalysing Action . 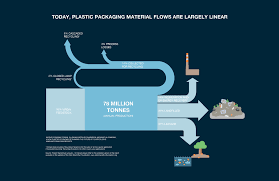 New Plastics Economy Catalysing Action reportIn packaging, plastics have a demonstrated track record of helping to store and ship more product with less material than many alternatives. And plastics’ ability to do more with less enables significant environmental benefits throughout the life of a package. Using less packaging material to start with—often called “source reduction”—helps to reduce energy use, greenhouse gas (GHG) emissions and waste. And plastics makers are already working with value chain partners to bring about even greater contributions to sustainability, including increased recycling. The key to sustainability lies in using any material efficiently, and less weight often means less waste in the first place. That’s just one of the reasons sustainability is best evaluated across the full life of a product or package. Anything else is only part of the story. Unfortunately, Catalysing Action singles out specific resins such as polyvinyl chloride (PVC), polystyrene (PS) and expanded polystyrene (EPS), which are used in relatively small volumes in packaging, and states that because these materials’ recycling rates are low, alternatives would need to be explored. These materials are in use today because they offer specific and sometimes unique properties that can provide important performance and environmental benefits. PlasticsToday along with sister publications Packaging Digest and Pharmaceutical & Medical Packaging News conducted an exclusive audience survey on the topic of phase outs of plastics and packaging. View the results in this eight-page downloadable PDF. Too narrow of a focus? For example, a peer-reviewed life-cycle study found that commonly used cups, plates and sandwich containers made of EPS require significantly less energy and water than comparable paper-based or corn-based alternatives (such as polylactic acid, PLA), primarily due to EPS’s much lower weight ( Franklin Associates, 2011 ). And new innovations are making it easier and more efficient to chemically and mechanically recycle EPS. This is why many sustainability experts are moving toward a holistic approach called Sustainable Materials Management (SMM) , which is based on life-cycle analysis. SMM takes into account the material, energy and water used across the lifespan of a product or package, from manufacturing to transportation to end of life. Lightweight plastic packaging plays a key role in protecting and safely transporting goods, which reduces waste, material and energy use, and GHG emissions. SMM considers all of these impacts of a package, not just its ability to be recycled. In a life-cycle context, plastics and plastic packaging typically compare favorably to alternatives in many applications. A 2016 study by Trucost found that the environmental cost of using plastics for consumer goods and packaging was nearly four times less compared to using alternatives for the same job—a difference of $139 billion versus $533 billion annually. As we look for ways to enhance sustainability, we should remember functionality and environmental benefits often go hand-in-hand. From food packaging that helps prolong freshness and prevent food waste—which has significant environmental impacts—to sterile medical packaging that improves safety, specific packages are designed to protect products. And that protection helps to avert damage, loss and waste. Of course, recycling also is an important part of a package’s environmental performance. Plastics makers, brand owners, retailers and recyclers are working to advance plastics recycling through better sorting equipment, collection practices and education. Increasing access to single-stream collection, moving from bins to 96-gallon recycling carts, and growing grocery store takeback programs for film are among the actions dramatically expanding the types of plastics that can be recycled and consumer access to plastics recycling programs. While there are economic barriers to recycling 100% of any material, new technologies are leading the way to recover more of the energy embodied in plastics. These new technologies have the potential to create a diverse range of products from non-recycled plastics, including fuels and feedstocks for manufacturing. Steve Russell is vice president of the American Chemistry Council’s Plastics Division, the industry’s source for solutions-oriented programs, scientific research, and public outreach initiatives for the plastics industry—with a particular focus on sustainability, recycling, recovery and marine debris.